We have carved a niche amongst the most dominant names in this domain, engaged in offering Lisbon Wall Care Putty. 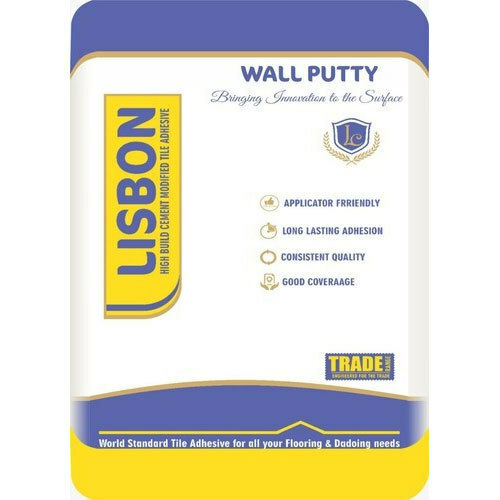 Lisbon Wall Care Putty is a water resistance white cement based wall putty ideal for use on concrete / mortar walls (Internal and External) and ceilings. It fills the fine pores of mortar / concrete walls and ceilings and provides a white, smooth & dry surface, essential for painting. It has more adhesive strength, durability and enhances the life of paint. 12.5 sft / kg / Coat / (500 sft / 40 kg's Bag) - The coverage will be depending on the surface condition. Lisbon Construction Chemicals offers a wide range of Tile Adhesive, Lisbon Wall Putty and many more.